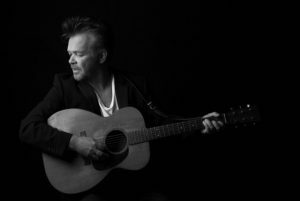 John Mellencamp’s career in music, spanning more than 35 years, has seen him transition from pop star to one of the most highly respected singer/songwriters of a generation. Mellencamp is incredibly acclaimed; he is a member of the Rock and Roll Hall of Fame, a Grammy winner, a recipient of the John Steinbeck Award, ASCAP Foundation’s Champion Award, The Woody Guthrie Award and Americana Music Association’s Lifetime Achievement Award and more recently, the Founders Award, the top honor assigned by the American Society of Composers, Authors and Publishers. Additionally, he will be inducted into the Songwriters Hall of Fame on June 14, 2018. He is also one of the most successful live concert performers in the world. In 1985, Mellencamp, together with Willie Nelson and Neil Young, created Farm Aid. The social activism reflected in his songs helped catalyze Farm Aid, the concert series and organization that has addressed the struggle of American family farmers for more than 25 years. John Mellencamp’s album, Sad Clowns & Hillbillies, featuring Carlene Carter, is his 23rd over the course of a remarkable career. Sad Clowns & Hillbillies returns Mellencamp to the musical eclecticism that is, itself, a reflection of his wide-ranging musings on life and showcases a poet who has wisely used the years between youth and the present day to become an absolute master of songwriting and interpretation. That passion and experience resonates most beautifully in this showcase of his music. John also wrote the title song for the film, The Yellow Birds, an American war film directed by Alexandre Moors and based on the novel The Yellow Birds by Kevin Powers. The film stars Tye Sheridan, Jack Huston, Alden Ehrenreich, Jennifer Aniston, and Toni Collette. A theatrical release of this movie will debut June 15, 2018. As well, John journeyed into the darkness of coal mining life in his reverent cover of Merle Travis’ 1946 song “Dark as a Dungeon,” recorded in support of National Geographic’s acclaimed documentary about the mining industry, “From The Ashes,” produced by Michael Bloomberg, former NYC Mayor. John continues to focus on another facet of his artistic expression: painting. His style has progressed over the years as evidenced by several gallery shows and published portfolios, and in recent years he has increased his output by completing over 100 new works. Currently John’s second solo exhibition at the ACA Gallery titled “Life, Death, Love, and Freedom” opened on April 26, 2018 running through June 2, 2018. Ghost Brothers of Darkland County, a musical/play with music and lyrics by John Mellencamp, a libretto by author Stephen King and production by T Bone Burnett will travel to various colleges and regional/local theaters in 2018. 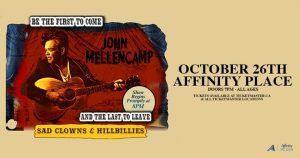 Mellencamp continues his journey as the walking embodiment of heartland rock; passionate, plain-spoken, and a self-proclaimed rebel. John Mellencamp continues to live and work in Bloomington, Indiana.